“Higher or lower?” That is the question you’ll face many times in Fremantle’s Play Your Cards Right slot machine – with correct choices seeing you strut away with a boatload of cash! 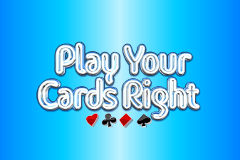 The Play Your Cards Right game show was first broadcast on ITV back in 1980 but proved to be extremely popular, so much in fact that it ran for a total of 16 series and resulted in 248 episodes being aired – all of which were presented by Bruce Forsyth and saw some of the most legendary TV game show catchphrases in history coined – such as "Nice to see you, to see you?" which resulted in the audience responding stating “Nice”. It begins with a fabulous opening animation accompanied by the original theme music playing out and the loud clapping from the audience as the stage is revealed. Set in the television studio with bright lights adorning the stage, the Play Your Cards Right slot machine has a setup of 5 reels and 15 paylines and provides you with an opportunity to step into the shoes of a contestant for exciting wins. With a superb design that appears exactly like the real show, original upbeat sounds from the ring out as you spin the reels (or shuffle the deck) as referred to along the bottom of the reels, with cash pots accumulating sums of money as you spin the reels and two exciting bonus features on offer – Double Chance and the Grand Final. The symbols in Play Your Cards Right are pretty basic but translate the retro style across the reels perfectly. Upon loading the slot you’ll notice that there are blue and red sets of playing cards in the top right corner and these see cash accumulate each and every time you land their respective symbols on the reels – with you then being able to scoop up the cash in the Double Chance bonus game. A Joker acts as the Wild and, how online slot machines work the majority of time, possesses the ability to substitute for all but the special symbols – which in this case are the Grand Final bonus, the Double Chance bonus, and the red and blue cash pot symbols. There is also a playing card faces of a King, Queen and Jack with suits of Heart, Diamond, Club and Spade all featuring too. It’s pretty disappointing that Bruce doesn’t make an appearance on the reels – or even one of his glamorous assistants ‘to give us a twirl’ as he frequently requested. The first of two ‘Brucie bonuses’ begins when you land three or more of the Grand Final Scatter symbols in any position on the reels. In true television game show style, it sees you take to the stage with one of Bruce’s glamorous assistants positioned to the left of the board and you are tasked with choosing whether the next card will be higher or lower than the previous. Playing cards are positioned across three rows for you to navigate through with rewards of 2x (for completing the bottom row), 5x (for completing the middle row) and 10x (for the top row) your initial stake up for grabs depending on how you do, with a lovely animation displaying your total win accompanied by music when the feature draws to a close. It’s time to scoop those cash pots that have been accumulating in the base game once you land three or more of the Double Chance symbols consecutively on a payline. Again you will be faced with two rows of cards just as occurred on the game show and the task will be to decide whether the next card to be revealed will be higher or lower than the previous one. If you complete the blue row you win the blue cash pot, while completing the red row sees you win the red cash pot too – plus just like the real game you have the ability to freeze if you find yourself stuck with a middle card like 6 and don’t want to risk making a decision. That was another popular quote from Bruce and the same can be said about the slot machine developed by Fremantle. It has the retro style rom the 80’s (just like the Endemol Games 321 slot machine) with original sounds included, the cash pots to accumulate funds in and two very rewarding bonus features.